Sometimes exotic species form hybrids with native species, so that subsequently the newly emerged hybrid becomes dominant in either the novel or native geographic location. For example, Typha x glauca is a hybrid of T. latifolia and T. angustifolia, which has displaced native T. latifolia in many locations in North America. Hybridization can create new genotypes either via interspecific or intraspecific combina tions ofinvasive species with either native or nonnative types. Introgressive hybridization may make species more invasive than they would be otherwise, and may be a contributing factor in the aggressiveness of Lythrum salicaria (Figure 3), Myriophyllum spicatum, Phalaris arundinacea, Phragmites australis, and Typha x glauca, especially in North America. Hybrid species sometimes threaten the genetic integ rity of endangered species. For example, streams in the White Mountains of Arizona were originally occupied by Apache trout (Oncorhynchus apache), which are now very rare because of hybridization with closely related invasive species including cutthroat (O. clarkia), rainbow (O. mykiss), brook (Salvelinus fontinalis), and brown trout (Salmo trutta). These fish species were introduced to these streams in Arizona after the 1960s. Allozyme electrophor esis in 1987-89 showed that of the 31 populations sampled, only 11 had pure Apache trout. Apache trout are a federally endangered species, but it will be difficult to preserve them in a setting where so many closely related species have been introduced. 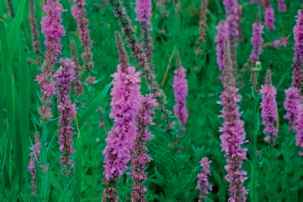 Figure 3 Lythrum salicaria (purple loosestrife) is an emergent perennial species native to Eurasia, and an invasive species of wetlands in northern North America. Photo by B. Middleton. In restoration areas, genetic integrity may be compro mised in situations where invasive species have either been intentionally planted or when invasive species have taken over sites. Hybrid cordgrass (Spartina alterniflora x Spartina foliosa) has taken over restoration sites in San Francisco estuaries. Hybrid cordgrasses differ in size from native cordgrasses, and are not used by the endangered clapper rail (Rallus longirostris), the species for which the coastal marsh restoration projects are designed. Invasive hybrid species threaten the success of restoration sites, both by comprising the genetic integrity of the vegetation, and altering the functional qualities of the site.